This project makes my little passively cooled datacenter project look like amateur-hour (ok, it looked like that before). 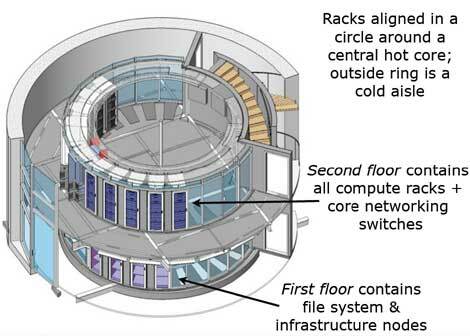 The entire building was built for 20M$ back in 1965 to house a giant Van Der Graaf generator, but now it’s a pretty sweet looking ultra-efficient datacenter (pdf)! This kind of thing just inspires me because its a mix of conservation, green design, high tech utilitarianism, and modern architectural art all wrapped into one. This entry was posted on Thursday, December 10th, 2009 at 11:52 am	and is filed under Server Management. You can follow any responses to this entry through the RSS 2.0 feed. You can leave a response, or trackback from your own site.